Firefighters find body of Michael McLendon's mother in burning house at 3:30 p.m.
(CNN) -- Alabama authorities on Wednesday released a rough timeline of a gunman's rampage in the southern part of the state on Tuesday. All times are Central Daylight. 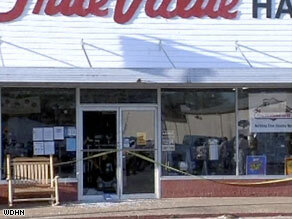 Glass from a door is broken at a True Value Hardware store in southern Alabama. Before 3:30 p.m.: Michael McLendon, 28, fatally shoots his mother, Lisa White McLendon, and her four dogs and sets fire to her Kinston, Alabama, home. "We knew that he liked guns," said Kenneth Smith, a neighbor of McLendon's. "Every couple of weekends or so we could hear gunshots out in his backyard. Just bam, bam, bam. A lot of shooting." About 3:45 p.m.: McLendon takes rampage to nearby town of Samson, Alabama. He kills 5 people on his uncle's porch, including 3 relatives and the wife and child of a sheriff's deputy. "My reaction is, my neighbors got shot, my friends got shot, something's wrong -- go check if there's anybody alive," said neighbor Alina Knowles, who rescued the 3-month-old daughter of Deputy Josh Myers from the porch. "I ran over there to see if there were any survivors, heard the baby, picked her up," she said. "What I saw, there were no words for it. There is no describing what I saw." "This is a very tight-knit neighborhood. All the neighbors around here are a family," said Myers, father to Corrine Gracy, 18 months, and husband to Andrea Myers, 31, both victims of the shooting. "Every day she was up on the porch talking with neighbors just like they were family to us. She hardly knew anybody here to have enemies," he said. "She was a super mom, Corinne Gracy was the sweetest thing in the world. I don't even know how to comprehend what's going on." After 3:45 p.m.: McLendon fatally shoots his 74-year-old grandmother, who was standing in the doorway of her home next door. "The whole community is still in shock," Samson Mayor Clay King said. "I personally know everyone that is involved, both the shooter and the victims. And that makes it more difficult to have to deal with." Before 4 p.m.: McLendon drives east on Highway 52, killing two and injuring two others while he fires into businesses and vehicles. "We were all frightened," said Sandy Morris, who owns a hair salon in Samson. "I mean, we had never in our life had anything like that to happen." 4:01 p.m.: McLendon fatally shoots a man traveling in a vehicle on Alabama 52. Alabama state trooper Mike Gillis receives report of a person shooting at people in Samson, and proceeds toward Samson on Alabama 52. 4:06 p.m.: McLendon opens fires on police pursuing him, wounding Geneva Police chief Frankie Lindsey. "The response was very quick. He was intercepted in Geneva by one of our officers, and then the chief of police arrived at the scene. Both of those received fire from the assailant. The chief of police was nicked in the arm, not very seriously," Geneva Mayor Wynnton Melton said. 4:17 p.m.: McLendon kills himself after exchanging gunfire with police outside Reliable Products in Geneva. "Within minutes, shots were heard from within Reliable Metal and law enforcement officers found him dead from what are believed to be self-inflicted gunshots," Cpl. Steve Jarret said.